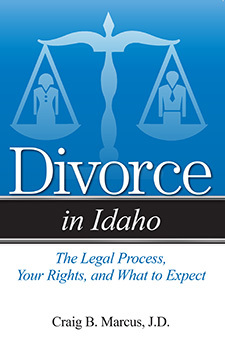 Are You Considering a Divorce in Idaho? Attorney Craig B. Marcus understands your needs. During his years of practicing family law, he and his firm, Marcus, Christian, Hardee & Davies, LLP, one of Idaho’s oldest law firms, have helped thousands of individuals navigate the maze of divorce. In Divorce in Idaho he answers not only the questions on your mind but also those you may not have thought to ask. How long does it take to get a divorce in Idaho? Who decides who gets the cars and the house?